Who am I? I’m a big orange tabby named Sherlock—like the detective. Like him, I notice everything, but I have trouble getting people to listen to me. Most people—like my former owner—tend to ignore the cat. But Bree (that’s Dr. Bree Mayfield-Watson to you) is different. I hope I’ll be able to communicate with her. After all, I did help her discover who killed her boss. Speaking of her boss, I used to live with him. When he rescued me from a shelter, I was pathetically grateful. Until I got to know him. For starters, he didn’t bother to give me a name—just called me cat. He provided food and medical attention, but nothing else. No love or affection. Then one day he didn’t come home. No food. No fresh water. Nothing. I wasn’t sad to learn he was dead. When a handsome detective rescued me and brought me to Bree, I was a little skittish. Can you blame me? For all I knew she might have been just like her boss. Thankfully, she wasn’t. Bree—who used to be a dog person—took me in and shared her home with me. She gives me treats, toys, and even lets me sleep on her bed. When she’s baking, which she does a lot, the whole apartment smells almost as delicious as a can of premium tuna kitty treats. In return, I protect her and help her by pointing out clues she may have missed. I can also sniff out which boyfriend took her to dinner, what she had, and even if she’s been visiting those blasted dogs at The Barkery pet bakery. But that’s not all. I even saved her life during our last case. I did it by—oops I’ve got to go. I hear Bree in the hallway. We’re in the middle of a new case, and I need to get back to work. As soon as I convince Bree to snuggle with me on the couch and tell me all about the clues she’s gathered, I’ll help her solve the mystery. And if I’m lucky, I’ll get some Barkery cat treats and a chin rub in the process. 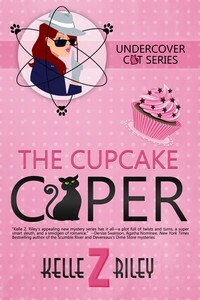 To find out more about the adventures of Dr. Watson and Sherlock the cat, check out The Cupcake Caper by Kelle Z. Riley. Available on Amazon or wherever books are sold. Also visit www.kellezriley.net to learn more. Thanks, Tonya! It was fun to write. I love it, a cat named Sherlock! My kitties are all named after scientists (go figure) so it was a pleasure to be able to name a cat after a literary giant in the book! This was such a great first book. Can't wait to read more in the series. The Cupcake Caper is a great book. I really enjoyed it! Thanks, Celia. I'm glad you enjoyed it. I love this...a cat named Sherlock leading the investigation, well, with some communication difficulties. I love it!! Kathleen, in real life I always tell my cats not to type. Mine are NOT good at it. I try to limit them to filing duties! LOL. Sweet! Definitely one to look forward to reading! Love orange cats, especially those who can type and solve mysteries! He will love you, too!